Podcast Guests & Radio Guests: Featured Talk Show Guest Expert Sponsors - Radio Guest List.com - How to Get Radio Interviews and Find Podcast Guests! 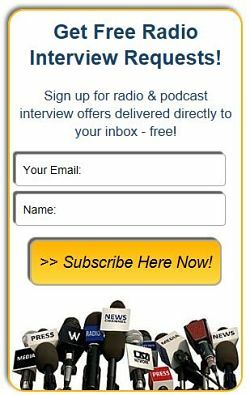 Podcast and Radio Guest Interviews with our Featured Experts can help your radio show or podcast attract more listeners! Listeners love smart, funny, engaging, and authoritative experts as talk show radio guest experts. Book these podcast guest experts for radio interviews to give your radio, podcast, or TV talk show audience a treat today! Mr. Easlick has 25+ years of National Fraternity management experience, unique qualifications in this area of plaintiff's witnessing. If you read about cases of Fraternity hazing, sexual abuse, or substance abuse, Mr. Easlick has most likely been involved because he understands the risk management codes, the liability insurance scams, and the positions taken by the Fraternities and their insurance carriers. Gary VanDyke runs an international charity that feeds thousands of orphans. He talks about overcoming challenges, explains how 37¢ can save the life of an orphan, offers donation and partnership opportunities, and entertains and encourages audiences. Gary's real-life stories of orphans motivate and encourage. Your listeners will soon be repeating his stories to everyone they know. The entertaining mother/son self-publishing team of C.B. and Dan Hoffmann would love to inspire your audience to turn their dreams into do-it-yourself projects. They are experts in creating and producing eBooks, Audiobooks, videos, photography, websites, marketing materials, and in encouraging others to realize their DIY publishing dreams. Brad Johnson connects directly to spirit and can issue any command to spirit and receive it instantly. With ten years of experience as a psychic, channeler, healer and metaphysical researcher, Brad has the unique ability to work with Spirit/Source all the time. He works to help bring powerful spiritual education and instant spirit healing to others on any issues whether physical, mental, emotional or spiritual related. Lisa Boucher is an expert in recognizing the early symptoms of Alcoholism. Lisa is also the award-winning author of Raising the Bottom: Making Mindful Choices in a Drinking Culture. From personal experience Lisa can discuss why she quit drinking at an early age, and how doing so changed the whole trajectory of her life. And, she will guide your listeners on what to look for and how to help themselves. Historian and author Steve Snyder is an expert on the 8th Air Force and the Air War Over Europe during World War II. Shot Down is a true story about brave individuals, featuring Steve's own father, pilot Howard Snyder, and the crew of the B-17 bomber plane, Susan Ruth. It is set within the compelling events of the greatest conflict in world history. Can Nobel Prize-winning chemistry double your lifespan? Chris Burres, Co-Founder of SES Research, Inc., would like to share the answer to this question, as well as the details of the 2012 longevity study which showed a novel form of Carbon (C60) to increase the lifespan of mammals by 90%. The implications of this study are that the average human could live to 150 years of age. Pete Canavan has been helping others stay safe from both online and offline threats for over 20 years though his IT security company, his martial arts teaching, and his books. He'll share critical safety secrets he has discovered through his unique blend of experience as an IT security consultant, self-defense instructor, university public safety officer, and event security professional. Douglas Smythe is an expert in the art of traditional shaving. He believes that we have been lied to for years by major multiblade razor companies. And, we have been inadvertently hurting ourselves by using their cheap, plastic, "one size fits all" razors. Doug has made it his mission to wake folks up about the "Cartridge Conspiracy" and make everyone aware of much more effective ways of shaving. Clint Arthur transforms authors, speakers, coaches, advisors, consultants, and experts into celebrities in the eyes of customers & prospects. Celebrity Entrepreneurship is Clint Arthur's new book on how "regular people" can be seen as celebrities by people they want to Influence, so that they can have more Impact and Income. Digital Marketing Strategist, Author, Entrepreneur, Trainer, and Speaker. Matt is the co-host of Unknown Secrets of Internet Marketing, the most popular SEO Podcast on iTunes, and Author of Build Your Brand Mania: How to Transform Yourself Into An Authoritative Brand To Attract Your Ideal Customers. Jay and his wife Liz are Co-Executive Directors of the national childhood cancer research non-profit, Alex's Lemonade Stand Foundation. Their daughter Alex, a childhood cancer patient, hosted lemonade stands to raise money for childhood cancer research. Alex passed away at age 8, shortly after reaching her $1 million goal. ALSF carries on her legacy to find cures for all children with cancer. As discussed in his memoir: Adversity Defeated: Turn Your Struggles Into Strengths, Marc Hoberman is an Educational Consultant who is an expert in SAT/ACT test prep, overcoming teen illness, and beating stress. His expertise in education combined with experience with his own illness (and how he would not allow it to define him) will be inspirational for all teens or their parents who hear his story. Autism dad and Autism Village founder, Topher Wurts, will provide your audience a better understanding of the obstacles in daily life for the 3 million U.S. families who are living with autism. Autism Village is in the midst of a Kickstarter fundraising campaign for it's first release of a new Mobile App that will work like Yelp or TripAdvisor to help everyone in the autism community. Danielle Kunkle has helped thousands of beneficiaries across the nation to survive the intimidating Medicare enrollment process. Danielle enjoys clearing up the "Medicare Mystery" for overwhelmed Baby Boomers as they age into Medicare. She is the co-founder of Boomer Benefits, an insurance agency that specializes in Medicare plans, and can explain Medicare in terms that are easy to understand. Velma Trayham is an expert at building brands from the ground up. She has helped hundreds of entrepreneurs, pastors, and leaders around the U.S. achieve growth and visibility in the market place. Velma wants to share the secret of embracing your own “GO” moment so that you can move toward the destiny that God has ordained for you, too. Craig Smalley is a tax expert with extensive knowledge of individual and business taxation. With over 22 years of experience solving client tax problems, Craig can help your listeners understand the tax code better. He specializes in individual, corporate, business, and small business taxation, as well as IRS audit representation. More details and Guest Expert radio interview booking info..
Are you a distracted entrepreneur who tends to procrastinate? Lyman Montgomery, a Productivity Coach and Author of Focused Driven Lifestyle, can help you to be more focused, productive, and profitable while maintaining a healthy work-life balance, too. Dr. Christopher Zoumalan, MD FACS, is a renowned Beverly Hills-based Board-Certified Ophthalmic Plastic and Reconstructive Surgeon. An expert on scars, scar healing, cosmetic eye surgery, and plastic surgery, Dr. Christopher Zoumalan is available to discuss the revolutionary new advances in scar creams, as well as eye surgery, cosmetic surgery, and all skin healing considerations. Eric is an expert in overcoming procrastination and the author of The Discipline Of Now: 12 Practical Principles To Overcome Procrastination. Your listeners will receive proven principles to help them maximize their time, minimize stress, and break the procrastination habit so that they can accomplish their goals and achieve fulfillment. Conservative commentator on social and political news of the day. The author of more than 150 Washington Times online columns, Dr. Fedewa is known as an early interpreter of the Donald Trump phenomenon as well as fiscal, racial, and religious trends and events. Gerald Leonard helps organizations and individuals "Develop a Culture That Works" to deliver the right projects the right way and improve performance and profits. Gerald's 7 principles for improving business culture is an insightful and unique way of combining the author’s expertise as a professional musician and certified Portfolio Management Professional (PfMP) to help transform his clients' cultures. If you or your listeners are interested in cost-effective marketing and public relations strategies, Scott Fox can help. Scott is a serial entrepreneur, best-selling Author, and the Founder of RadioGuestList.com, the #1 free radio and podcast publicity service. [YES - THAT'S THE SITE YOU'RE READING RIGHT NOW!] He's helped 10,000+ authors, celebrities, experts, and marketers get booked for free "Guest Expert" appearances on podcasts and radio shows worldwide. If your audience is interested in free podcast and radio publicity, Scott can help you teach them how! Everyone loves going to art fairs and Connie Mettler has attended more than anyone! As an exhibiting fine artist's partner for 20+ years, Connie turned her expertise into the top art fair web sites online to serve the artist and art fair patron communities. A best-selling e-commerce and online marketing author, Scott Fox is a world-recognized authority on today's hottest business topics: online lifestyle businesses, social media marketing, Internet startup businesses, and making money online. Book Scott today to help your audience learn to escape the rat race with a practical plan to build a niche e-commerce or publishing "lifestyle business" online. Thank you to these sponsors for supporting our free radio guest booking service. Hosts: Don't see the type of experts you're seeking? Submit the free Interview Guest Request form here. We'll send you the guests you want! Would you like to appear as a Featured Talk Show Guest Expert on this page, on Facebook and Twitter, and in our emails? Our affordable advertising will showcase your expertise worldwide! I first started using the free portion of Radio Guest List over a year ago. And had very good results. I was grateful for the free service so I actually donated money to them because it actually worked! When their low cost fee service became available I thought "what the hell" I might just as well buy the service. WOW !! The interview requests have been over the top for me to speak on the UFO phenomena and my film project Giant Rock The Move... I AM BOOKED ALL SUMMER !! I bought my Radio Guest List ad just a few weeks ago and already I've been on four radio shows, two were syndicated. I have done at least five radio shows from your list after dong the featured guest expert. What you do for so many authors is excellent. The online response to my Featured Guest Expert listing has been very good -- 15 interviews so far, and 4 actual appearances, all of which have been dynamic and, I think, effective. There's been a bump in book sales and I'm hoping for even more as the word spreads. HOLY COW! My cup runneth over! I’m promoting your Featured Guest Expert service on twitter and to my author friends. This Featured Guest Expert listing is aweseome! If you have something important you want to share,want to say, or want to sell on radio,RadioGuestList.com is your #1 resource. In a few simple steps, you can connect with hundreds of on-air shows looking for guests that will reach hundreds of thousands of listeners. I am a radio therapist, and offer my support to listeners suffering from addiction, trauma, mental illness, family & couple conflict and making 7 dealing with life changes. I have had very positive radio guest outcomes doing over nine shows in course if couple months since the release if my book. Thank you for the opportunity to get exposure for my book and to bring vital information to the public. Have three booked this upcoming week. Two in december and one in January so far, with most all of them thanks to you. Guessing about 45 counting 6 repeats, since we started this a couple of months back. I have been using your services regularly, and as recent as this past Saturday. I must say that I have never been more pleased with your "featured guests" than other services I have tried. The most recent, Dr. Daniel Twogood, brought great awareness and "ability" to my global listeners, and for that I am profoundly grateful! Keep up the great work radio guest list --- i will continue to see whose out there -- starting with RGL for sure! Since signing up with RadioGuestList less than a month ago, I have had ten requests to talk about my book Calm Focus Joy. It has been a great pleasure connecting with amazing people who are using radio to spread positive energy and ideas around the world. Thank you again RadioGuestList! Promoting The Globalisation of Love as a Featured Guest Expert on RadioGuestList.com was wonderful for publicity. I have been invited as a guest on several radio and podcast shows across the U.S.A. Thank you for providing such great service! I found Radioguestlist.com and was impressed from the start. The cost is low, and if you know anything about a service like this it can run in the THOUSANDS! the is the LAST thing new authors and experts can afford is the run around and the time it takes to find credible programs to be a guest on, radioguestlist.com takes care of that.